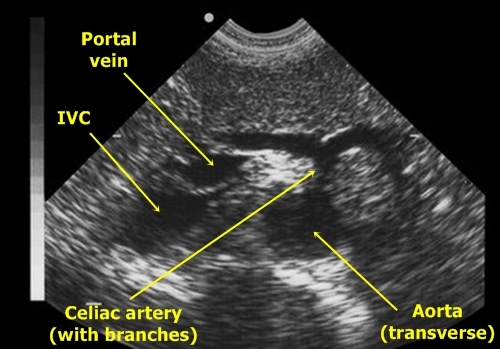 In abdominal sonography aorta may be sighted from upper epigastrium to iliac artery bifurcation. The view is possible in both sagittal and transverse section. 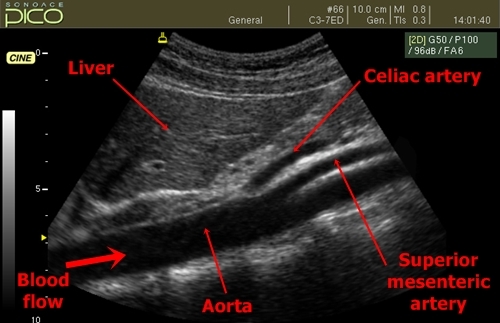 Longitudinal lateral (sagittal) view of the upper abdominal aorta. Besides the aorta and the liver in this view we can differentiate celiac artery and the separation of the superior mesenteric artery below. 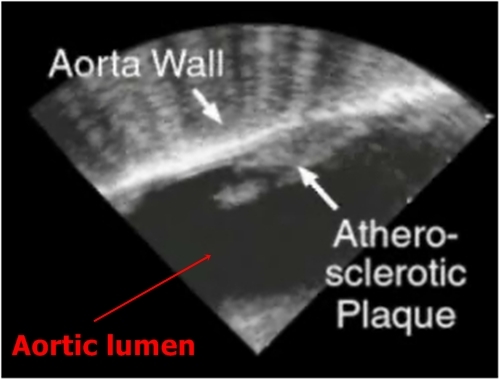 Atherosclerosis – We can see ultrasound of an atherosclerotic plaque with calcification as grey bodies in the aortic lumen. This is a frequent finding in elderly patients. Aortic Aneurysm - Abdominal aortic aneurysm is probably the most significant and most common finding. We must determine its longitudinal length, maximum diameter and its possible spread to outgoing vessels. 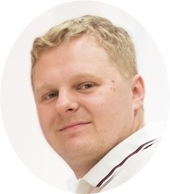 It is important to know that the aneurysm is often filled by a thrombus. While the lumen of the aorta is anechogenic, thrombus appears as a hypoechogenic grey formation. its diameter) . The rest of the aortic cavity is filled with a thrombus. 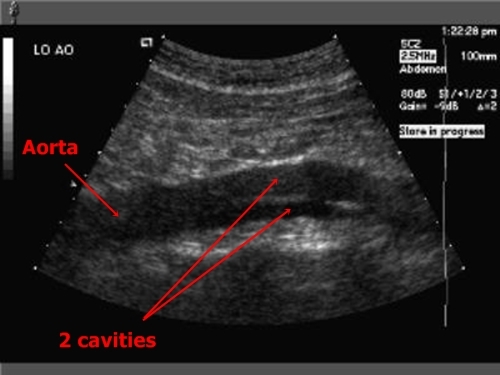 Aortic dissection - Probe shows two cavities inside aorta. One is the real (initial) lumen and the other was created newly by the blood flowing into the wall of the aorta. them originated from blood flow penetration into the aortic wall.